As evolution proceeds, more and more adjustment and flexibilities are “requested” for survival. To be noted is that evolution is based on superposing processes and not replacing, which basically means that what Philip Zimbardo argued see below *). Human brain is probably the most complex superimposed construction in the Universe not well understand by itself (our own brain). The picture above is from a presentation with speaker text (see also …). Increased flexibility, adjustment and learning increase also complexity BUT at the same time some crucial parts of the evolution do not change much, e.g. immune systems, autonomic nervous stress systems. They react quite the same although is exposed to very new circumstances they were not created for. This is the cost man pays now e.g. for the stress problems. Defend systems can misunderstand stimulus as in auto immune responses but non adequate stress responses related to precognitive and cognitive appraisal which can be relearned by operational conditioning – not effectively e.g. by pharmacological interventions. Furthermore – as man has started to take over the conduct of the evolution on earth man has not only challenged the whole environment but also gradually destroyed herself, e.g. by processing food in a very destructive way. Increased flexibilities mean increased interactions between gene, its expressions development and environmental demands. Mirror neuron and the process of basic learning including internalizations at a spatial brain levels (interaction communications modes are smell, sound, vision, touch, ..) emerges and construe the platform for survival efficacy. That is, what we will call “old brain” (reptilian and mammalian part of our brain) which also include emotional and basic attitudes development more and more sophisticated over time. Gradually also human brain begun to be developed where abstract information processing gradually was added to construct of complex memory systems. Sequential and later verbal information processing enabled time perspective – past, now and future where the value of learning by connect past with anticipation of the future probably was decisive for the fast development of human brain including of course diet options associated with food preparation (references here will come …). The combination of spatial and verbal information coding, still not well understood, was very successful for survival increased tremendously when verbal social communication and reasoning/problem solving could be communicated both between and within (internal reasoning, thinking) individuals over time! Multi-faced options developed and individuals and groups developed “map of the territory” which in civilized (?) man is called world map (e.g. Stephen Pepper, 1942, …) enabling internal and external conscious reasoning, analysis and decision making and its visual simulated performance before real actions were done. Anticipation outcome could increase survival. Individual fundamental platform for attitudes, values and believes are internalized (Vygotsky …) while our brain is still spatial code dominated and the qualitative nature of social-cultural-political internalization content and structures is decisive for individuals´ early life – if, and only if, the internalization content aloud it, individuals can gradually enable to developed a sequential, verbal autonomous internal map of the worlds based on the start setup. If new born is grown up during extremism or not-caring circumstances, we can expect them to forward the extremism or non-caring behaviors. Our genes are not any more a rigid blueprint, but more and more interplaying with individuals´ life development. More and more the internalization quality in human context will program individuals’ behaviors, attitudes etc. With extremism, we could also include the extreme manipulation by profit interests in preferably democratic societies! Here clinical sociology has not much constructive guide-lines to provide – yet. 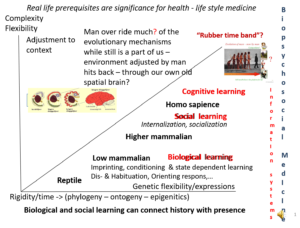 Concerning health development and responsibility (ability to respond) at society and individual levels internalization will be decisive for individuals´ health development (and costs also for the society). If internalization has convoyed fruitful behaviors then everybody wins but if not, and much of destructive biopsychosocial behaviors (diet, drugs, ….) den everybody is losing! On the other hand, freedom is enabling both alternatives. Perhaps only education at all levels are the only way to provide alternatives – internalization is not just something in the beginning but something working until our lives finished – a good lift or a destructive life where our missions is to solve how we can develop a constructive socio-cultural-political future for mankind! Children who have problems to adapt to follow accepted school behaviors can expects have adjustment problems related to early internalization requirements. IF so, it is not easy no fast manage them to adjust. “Normally” they either make resistance or “hide” as much as possible in the background. Understanding their prerequisites as well as how gradually deal with this – as I see it – based on two-ways communications and testings …. where the context also need to be considered. Forced exposing can here increase the problems. One way is to gradually reconsolidate the basic internalized precognitive constructs using ethical accepted strategies based on what really in the beginning is of interests. From there mutual trust can be developed. When motivation is “coming from within” (not forced) solutions may be generated. Each individual need to orient in their life based on a personal (internalized and further developed) world map. As we understand this such a map can be more or less external controlled (extern locus of control), we can also understand that there is a different in how people understand whether their private map really is one this is personal and not exactly the same as others although cultural groups maps to usually have much seminaries – or not! So called “besserwisser” can be understood as either playing games/fooling others or really believes their map is the objective map of every bodies real world. And – has this relevance to whether they have a “old brain” or “new brain” dominance? And – can the above give some hints how to help people to realized their map is personal and this is nothing to be afraid for! Meta perspective refers usually to be able to get a helicopter perspective on own situation where you can observe yourself as well as well as your social/environmental context and reasoning with yourself of what is going on. You can also in the same “review” an older situation. Both out of you own world map, but still with a perspective which can generate “second thoughts”. Genes activating male killing of their “not own” children are well-known in many species but how is it with some humans in power positions? Are similar genes on-activated in despots here killing not allied? Or, concerns it dominance internalized in their own grow-up cultural context? * Zimbardo brain development metaphor; Once upon a time their was a couple living in a small house, then the family grow larger and larger adding gradually rooms …. until they lived in a really shanty house – that’s is also the story of our brain! While each development is a superposing process – (in my present words) of neuron hard- and software where gene switched on interplay with adjustment requirements.